Aly Raisman’s lawsuit against the US Olympic Committee is a call for justice and true accountability. Raisman wants to know whether the USOC ignored Nasser out of benign neglect, or perhaps for more malignant reasons. Warnings about Nassar were reportedly bandied about for years, although the USOC and USA Gymnastics put their heads in the sand until an exposé published by The Indianapolis Star in 2016. The known facts tell us that even if you give the USOC every benefit of the doubt, more people were hurt precisely because they chose silence. Raisman’s lawsuit puts it out there is plain and brutal language, saying that the USOC “at the highest levels of its organization” knew what was happening, and looked the other way in order to keep the Olympic trains running on time. My highest priority has been to push for change, so future generations of athletes will be safer. It has become painfully clear that these organizations have no intention of properly addressing this problem. After all this time, [the USOC remains] unwilling to conduct a full investigation, and without a solid understanding of how this happened, it is delusional to think sufficient changes can be implemented. I refuse to wait any longer for these organizations to do the right thing. It is my hope that the legal process will hold them accountable and enable the change that is so desperately needed. 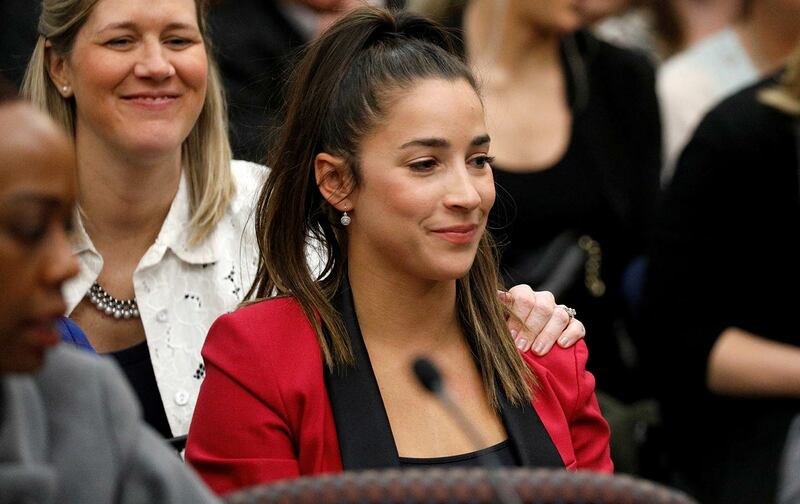 What makes the timing of Raisman’s actions so important is that she made the choice to throw down the lawsuit just days after the post–Winter Olympics resignation of USOC head Scott Blackmun. While Blackmun’s resignation was chalked up to legitimate health reasons, there is no question that his exit was thought by the USOC as another way—along with the mass dismissal of the USA Gymnastics board—to publicly turn the page on Nasser and display some kind of veneer of good governance. Raisman is making clear that the page cannot be turned until there is accountability; there cannot be peace in the Olympic Village until there is justice, or this will repeat itself again and again. With this lawsuit, we can be assured that we won’t have to settle for eventual congressional hearings, or have to stomach whatever the USOC’s “independent investigation conducted by a third-party” delivers. Instead, they will be held to account by an athlete whose only goal is forcing them to actually assess how they allowed an abuser access to their athletes and then chose to do nothing.